Like a fruit tart and a pavlova had a baby: this is the felicitous result. Light and delicate, making it perfect after a hearty feast. It is really guilt free if you eat it minus any toppings like the whipped cream or ice cream. I found this recipe on line, back before Thanksgiving, at splendidtable.com. I loved the look and sound of it but didn’t find time to make it until Christmas Eve. Once I tasted it; love at first bite. I devoured it with vanilla ice cream on top at the Christmas lunch, nice flavor combination. New Years Eve is coming up and I want to bake another, this time serving it like you do a Pavlova, with lightly sweetened real whipped cream on top. Yumm! It is really easy to throw together. If you are gf you can use the recipe I provide, I adapted her recipe to make it gluten tree. At holidays like Christmas Wegmans often has gf redi-made crusts. If you are a wheat eater use whatever cookie tart crust you like. I included cinnamon in the crust and found it added a lot to the complexity of the flavors. The crust absolutely needs to be pre-baked before you put the tart together. I should say I seldom use fresh cranberries; I generally make a fresh relish – old family recipe – for Thanksgiving but never got it made this past November. So I had the bag of cranberries in the fridge in the fruit bin. Yeah, it sat there a month: I did have to pick through it (you always should) after I rinsed them and remove and squishy ones. There are usually a few of those mixed in and they aren’t great for anyone to eat. Let them dry. Anyway, my point is; this tart is fantastic tasting even if you aren’t a huge cranberry fan. I used some smooth raspberry jam (what I had) but you could probably use most any jam. 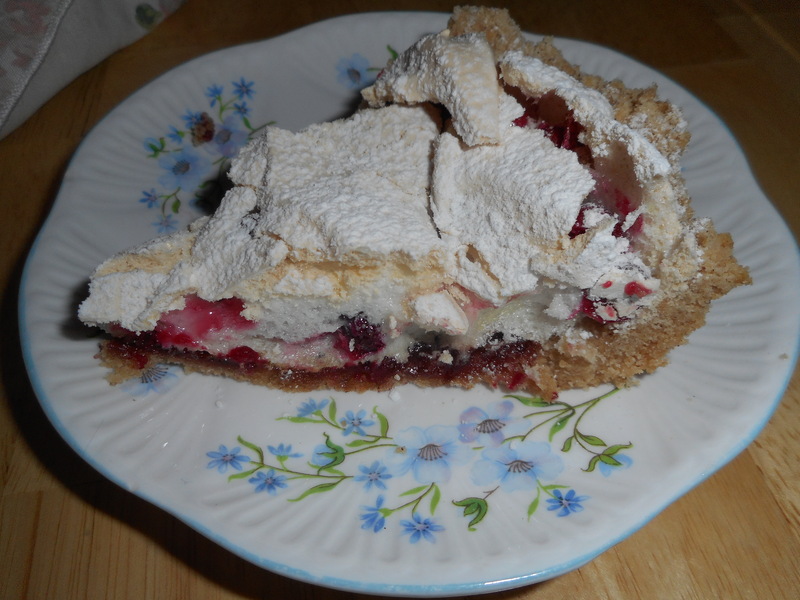 Just chose one full of real fruit in a flavor you enjoy as you can definitely taste the jammy flavor mixed in with the crust and the meringue topping. I loved it with raspberry jam, a favorite flavor for me. I didn’t take a lot of pictures as I wasn’t really planning to blog this recipe but it was so tasty I had to get it out there for people to try. Add 5 tbsp cold butter, cut into 6-7 chunks. Mix on medium low until the butter is just crumbs blended in. Pour the crumbs into a ten inch tart pan that was sprayed with cooking spray. Or a glass pie pan. Spread it up the sides. Press gently in so it is a cohesive crust but do not press really hard or it will be like concrete when you finish baking it! Bake at 350 degrees for 18 minutes. Set the crust on a rack to cool to room temperature. Do not let it get more than light brown. When you’re ready to fill and bake the tart: Preheat the oven to 300 degrees F.
Gently spoon the jam on top of the crust and spread it evenly over the bottom, I used the back of my big spoon for this operation. In a large bowl with a hand mixer, beat the egg whites with the salt at medium speed just until they are fluffy and fairly opaque. With the mixer going, add the sugar in a slow, steady stream, then keep beating on high until the whites are shiny and form definite peaks; they will look like marshmallow. This is a meringue. 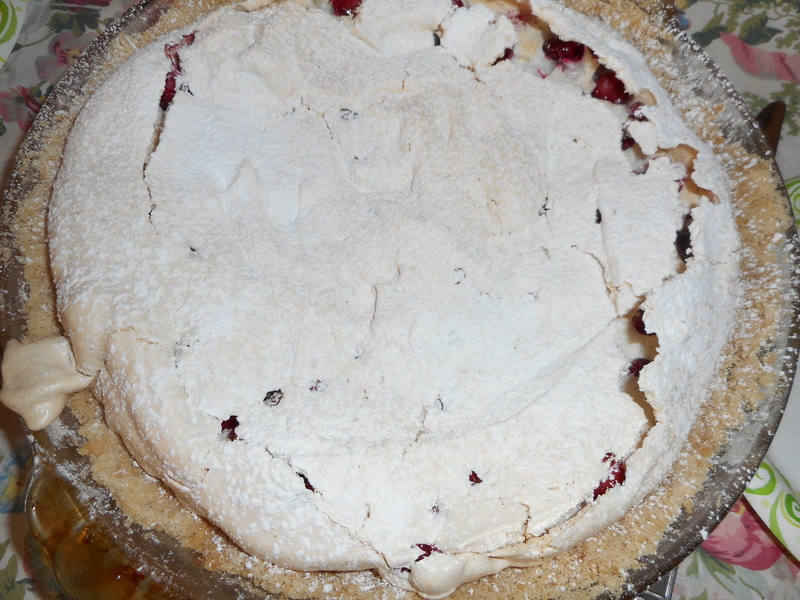 Pour the cranberries into the bowl of meringue and, using a flexible spatula or spoonula fold them into the meringue. Try to distribute the fruit evenly, but don’t mix too much– you want to keep the meringue fluffy. Spoon the meringue over the jam and spread it to the edges, making it swirly if you’d like. 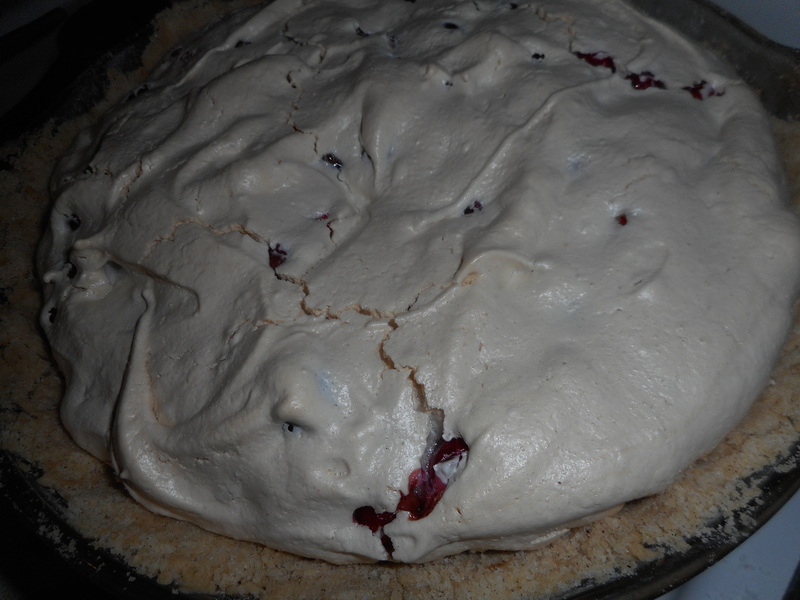 The jam might push up around the sides of the meringue, and that’s fine. Don’t fret if it looks like not enough filling, it will puff up in the oven to fill the pie pan. Bake the tart for 1 hour, at which point the top will be light beige and cracked here and there. (If you’d like more color, you can bake it a bit longer or even put it under the broiler.) I did not go there! Transfer the tart to a cooling rack and cool to room temperature. I did cut it while slightly warm and we all thought that was just perfection. If you’d like, and I do, dust the tart with confectioners’ sugar before serving. Whipped cream on top is also great.Storing: The tart is best the day it’s made, although it’s still pretty nice the next day. Leave the tart at room temperature, covering only the cut part with a piece of wax paper or plastic wrap. I doubt you will have any the second day anyway. It is that tasty.